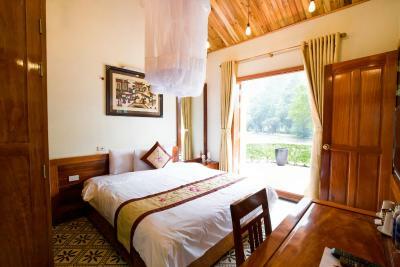 Lock in a great price for Mua Caves Ecolodge (Hang Mua) – rated 8.5 by recent guests! The location of the property is fantastic, right at the base of the stairs for Mua Caves. Breakfast options varied and the food was good. The cliffs and karst mountains all around were stunning and we really enjoyed being able to climb the pagoda staircase before the gates opened to all the tourist buses. The staff were pleasant and quick to help out if needed. In fact, they were very accommodating when we notified them we were arriving at 4am. They've done a nice job of landscaping the park. 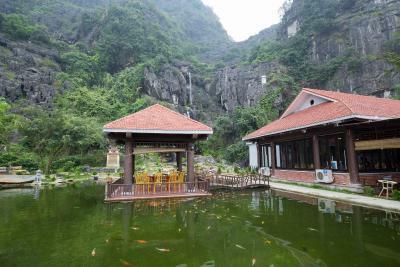 Ninh Binh is a beautiful area and Hang Mua is exceedingly gorgeous. Awesome accommodating staff. Coffee and mango shake were tasty. Access to mountain lookout vista. The staff was very helpful and kind. We had to catch a train early in the morning and they prepared a breakfast to go and opened the gates at 3 am ! Above and beyond. Plus free admission to the caves and a chance to see mountain with less people/great for pictures. The staff were friendly and helpful. 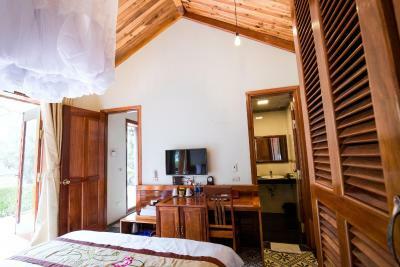 The rooms are comfortable and have the necessary facilities, including a good bed (with mosquito net) and TV with plenty of channels. The outdoor shower and bath are amazing, with a surprisingly great hot water system allowing for outdoor showers even during colder weather! The close proximity to the Mua Caves lookout is great too, but has its drawbacks. The area was stunning and it was great to be staying in the park. We were able to walk up to the viewpoint before the crowds arrived. There were also lots of beautiful bonsai's around reception. The staff were friendly and helpful. 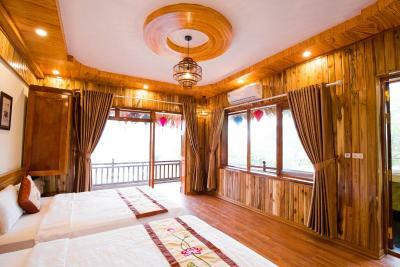 Hang Mua is a tropical resort located close to Tam Coc town. It cost about $4 to have a car drop us off from town. There were plenty of places in town that were able to call a car for us. 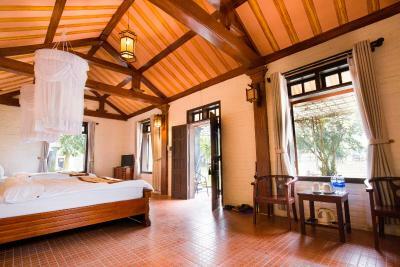 When we arrived, we were quickly shown to our room inside a bamboo hut. It was very pretty as we had a tree in the center of our room. The bed was clean and comfortable. We explored the grounds and the mountain without as many people once the resort closed. 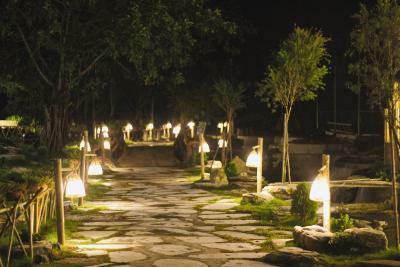 There were beautiful lights that lit the trails and walkways. 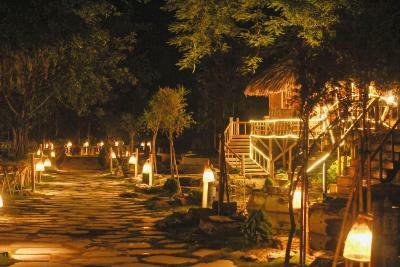 We had dinner at the restaurant on the property which was very good. 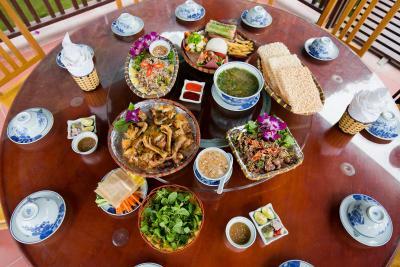 The breakfast in the morning was delicious with many options. We borrowed bikes to ride to Trang An boat ride, which we strongly recommend! (about 15 minutes away) When we arrived back, the young woman at the reception desk was very helpful in translating with our driver for the next part of our trip. 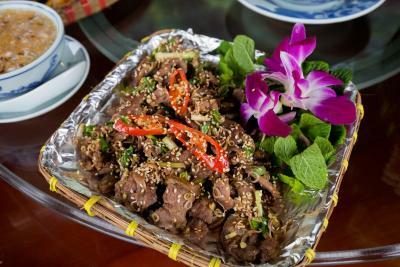 We highly recommend Hang Mua and just wish we had had more time to explore Ninh Binh! 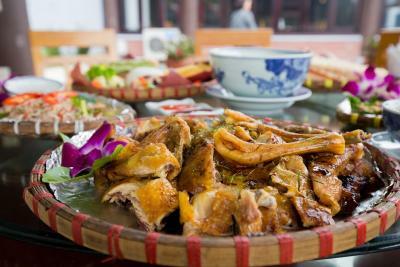 The restaurant was really good and convenient. Being inside the Mua Caves park made it easy to do sight seeing. 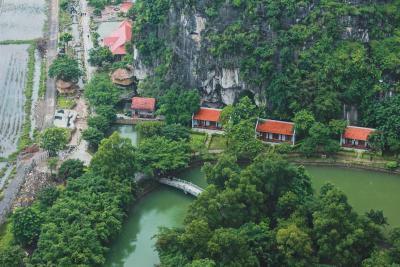 Location is great, just in between all major points of interest in Ninh Binh but away from the very crowded and noisy Tam Coc area. The staff also made it easy to get a car to drive us around for the day. 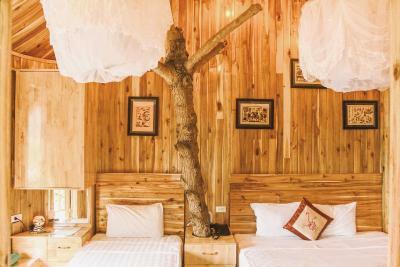 For the ecolodge itself, the grounds are well maintained, many picture worthy spots with super cute decor. easy to reach the dragon mountain. View on the top of the mountain is spectacular. 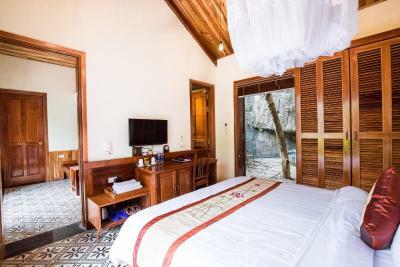 One of our top picks in Ninh Binh.Located 3.7 mi away from the city center,Mua Caves Ecolodge (Hang Mua) offers peaceful and comfortable accommodations with free WiFi access throughout the property. 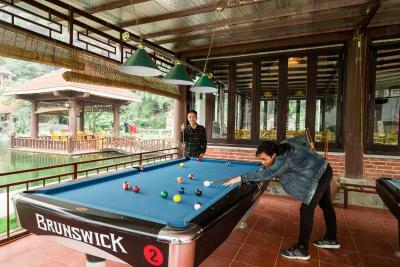 It operates a 24-hour front desk and provides complimentary parking on site. 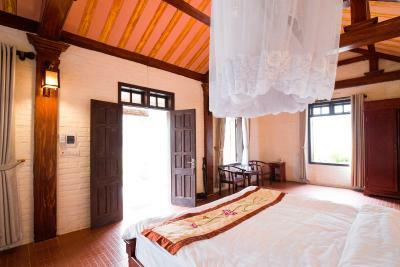 Fitted with tiled flooring, air-conditioned rooms feature a wardrobe, mosquito net, a TV and seating area. Mini-bar and electric kettle are also included. 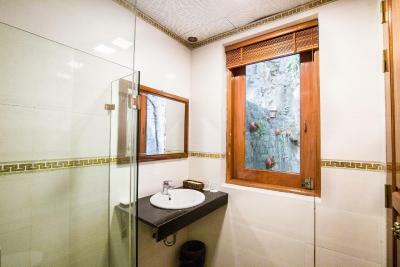 The private bathroom comes with bathtub or shower, slippers and free toiletries. 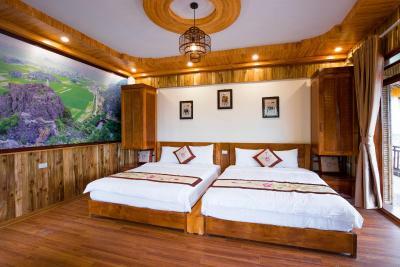 At Mua Caves Ecolodge (Hang Mua), guests may rent a bicycle to explore the area and visit nearby attractions. Currency exchange, luggage storage facility and tour arrangements are available. Airport transfers and shuttle services can be provided at a surcharge. 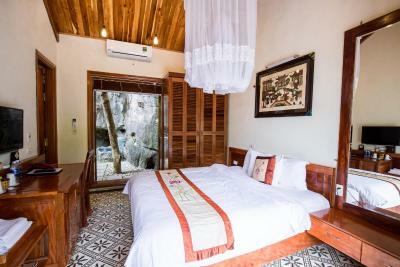 When would you like to stay at Mua Caves Ecolodge (Hang Mua)? This double room has a electric kettle, mini-bar and patio. 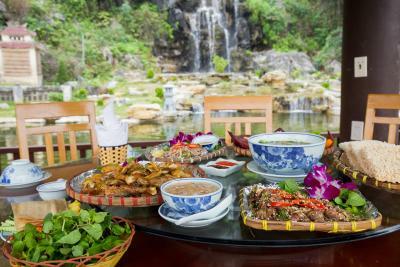 House Rules Mua Caves Ecolodge (Hang Mua) takes special requests – add in the next step! One child under 6 years is charged VND 200000 per night when using existing beds. 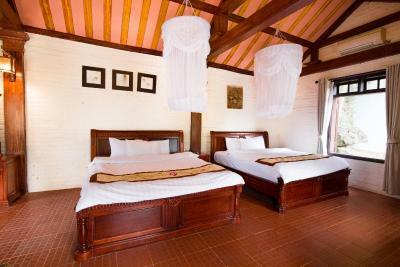 All children under 12 years are charged VND 250000 per night for extra beds. 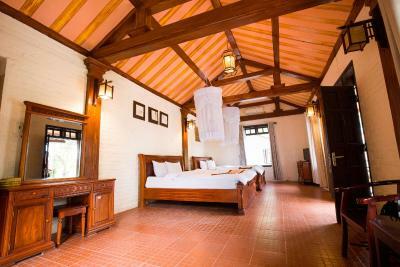 Any additional older children or adults are charged VND 250000 per night for extra beds. 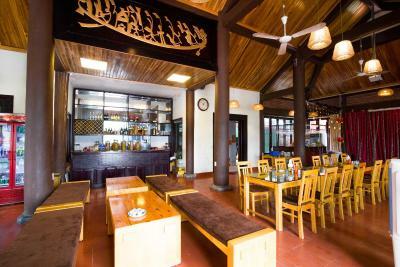 Debit card Mua Caves Ecolodge (Hang Mua) accepts these cards and reserves the right to temporarily hold an amount prior to arrival. 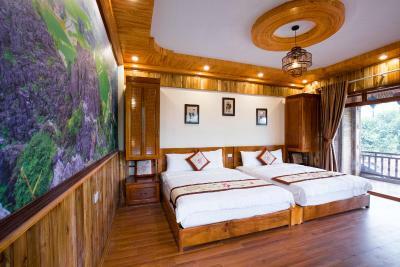 Mua Caves Ecolodge (Hang Mua) accepts these cards and reserves the right to temporarily hold an amount prior to arrival. 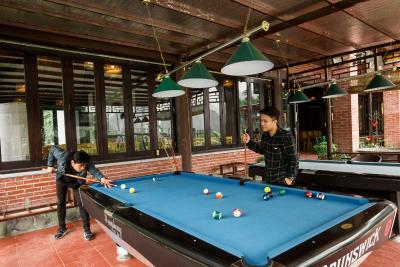 During booking, credit card is required for guarantee purposes only. The property accepts payment by cash when checking in/out. 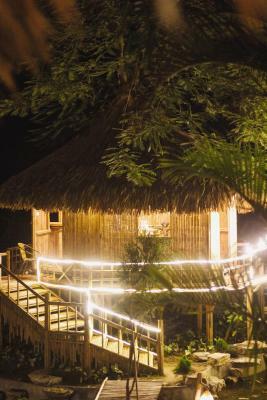 Please inform Mua Caves Ecolodge (Hang Mua) of your expected arrival time in advance. You can use the Special Requests box when booking, or contact the property directly using the contact details in your confirmation. 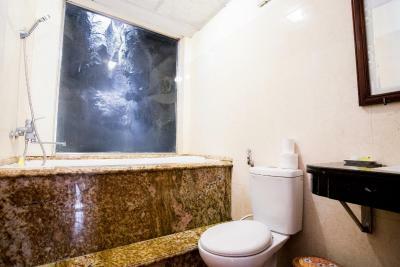 The bathroom didn’t have a proper shower, only a tub with a hose. Biggest issue was getting cabs to get there and back for dinner. We had multiple issues with drivers charging extra or refusing to take us home unless we paid double once hoping in the cab. Even grab was a problem. Ending up costing a lot more than it should have. This ints really fault of the property though. Rooms were great. Convenient to beat the crowds. Staff we great! Rat ate my fiber meal. I left it on the table and found it torn in the morning. They forgot to leave towels and as we checked in late, we didn't bother to ask for some,we used the small towels from the other room. Could really use a bit of cleaning before guests use the room. 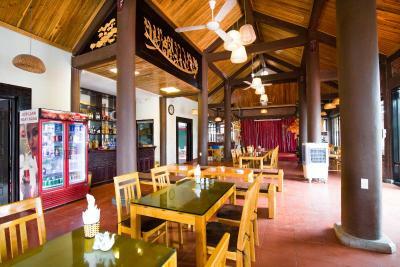 Associated restaurant in grounds was of a poorer standard, menu seemed good but quality of food was well below average. Service was also off-handed and prices a little on the high side. There was also a significant difference between breakfast times stated in motel welcoming email and restaurant which almost resulted in us not being served breakfast. 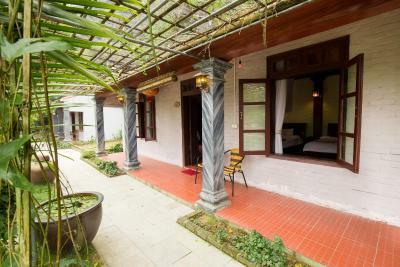 Great location, peaceful and serene after day visitors, set amongst rice fields. 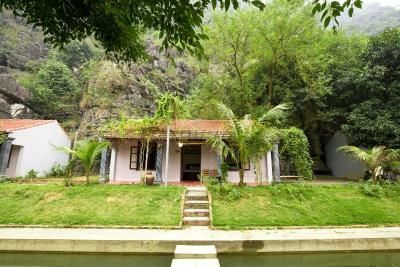 Spectacular scenery.. Easy access to main temple and shrine sites and surrounding towns with limestone cave boat rides etc. Staff were very friendly and helpful and always willing to provide assistance, directions and suggestions. We extended our stay by another night. Breakfast with a view! 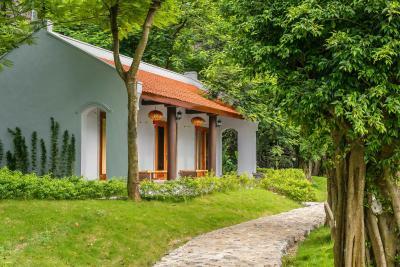 It is located next to the Mua Caves and the viewpoint over the "dry halong bay". Easy to get a motorbike and explore the surrounding nature. Great! 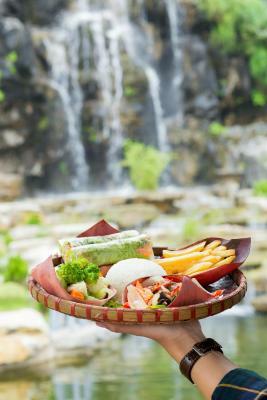 The food at the Eco Lodge was poor, best eat elsewhere. Perfect spot under the mountain; lovely views over the rice paddies; very helpful staff who recommended an excellent day trip (three hour boat ride; ancient capital, magnificent temple complex - highly recommended). Climb the mountain in the cool of the morning if you can, you must climb it because the views are sensational. Food from the restaurant wasn’t my favourite but was ok. This was a great get away. Clean, tidy, comfortable especially for its cheap price tag. You can get up early and beat the other tourists to the view point before it gets busy. We hired some bikes and rode to Trang An which was a lovely ride. Unfortunately the bathroom had a smell and wasn't as clean as it should be. 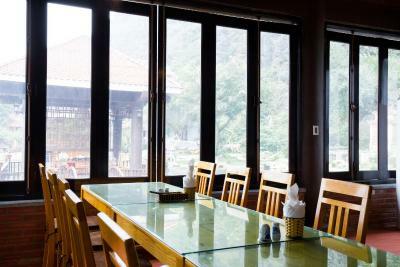 The breakfast included in the room rate was just sufficient - nothing more and the restaurant doesn't operate smoothly. We stayed for 3 days and all 3 mornings we were under the first guests (because we had booked daytrips), but served our meal last. The last morning we left without the meal we ordered when we saw we had to wait yet again. 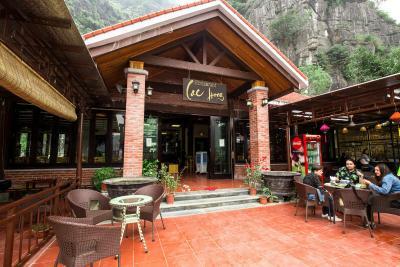 Guests who arrived half an hour later than us were served before us (we were the 2nd guests in the restaurant) in order not to miss our train to Ninh Binh. 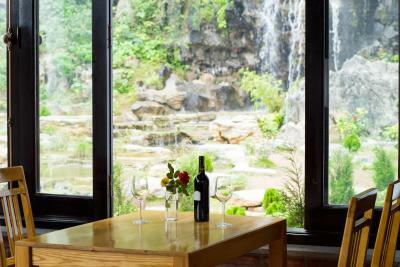 This venue is surrounded by beautiful nature - it is a shame that some of the staff do not keep Vietnam's high standards. The staff at the reception was amazing - friendly and very helpful. The venue is actually 5* so I do hope that the management will look into cleanliness of the rooms and the management of the restaurant. At first it felt a little bit like staying in a visitor centre due to crowds visiting the caves in the day time, but we quickly became used to that. 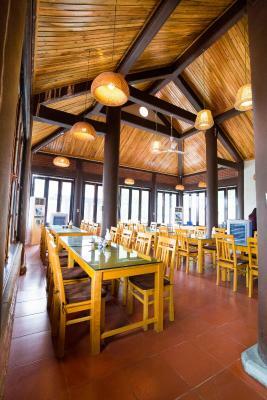 The restaurant is a bit canteen-like in layout. 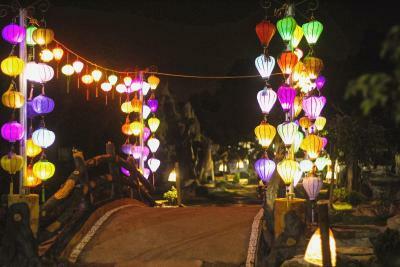 It's a beautiful setting, thoughtfully landscaped with attractive lantern lighting at night. There was a pool under construction during our stay which is going to be a lovely addition. 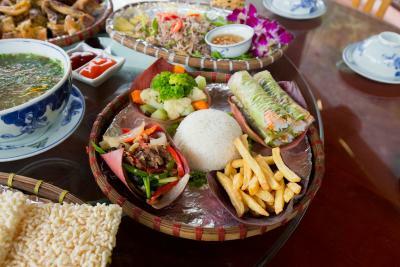 The food in the restaurant in the evening is good if you can't be bothered to go out. Reception staff were helpful. Bedsheets were not too clean. They hd hair strewn here and there. Can’t think of anything really . Couldn’t work the air conditioning in the room is the only minor quibble . 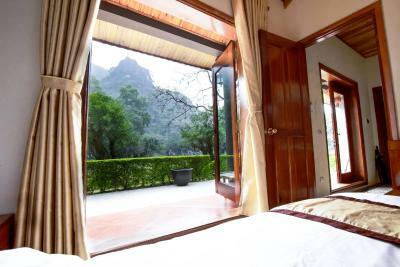 A spectacular setting - amazing views , beautiful gardens and water features ; lovely climb up Dragon’s mountain with even more spectacular views ; very friendly staff and incredible value for money . No voltage in bathroom for shaving, no peg in bathroom, breakfast could be more selection, sometimes it was to noisy. 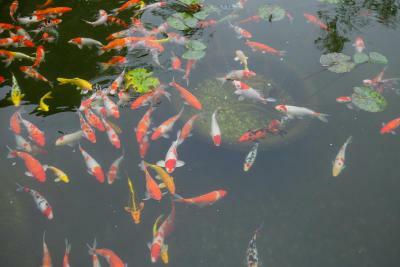 This was one of the strangest places we stayed on our visit to Southeast Asia. 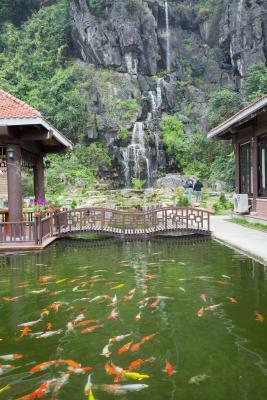 It's inside a park with a mountain and cave, yet it's kind of tourist attraction by itself. Man made waterfalls, statues of horses. It was bad by any means, but interesting. Staff was nice and gave us breakfast, bread and cheese and banana to take with us because they knew we were checking out early.